What is this "Car Pooling Information" malarkey? Club members may recall that in the Brisbane Bushwalkers website's previous incarnation, they were able to record some car details, and these car details would be attached to activity nominations. This was in place to assist leaders in arranging car pooling for activities. In the new website incarnation, this feature was not present. The good news is, we've just put them back better than ever! Good question! Here are a few features of the new Car Pooling Information system. Members may now add more than one vehicle to their profile. Adding a vehicle to a nomination is optional, and members may select which vehicle they wish to attach to their nomination. Members may change which vehicle is attached to their nomination, or remove it, after they have nominated. We've added a couple of extra fields - Make / Model, Colour, and a 4WD checkbox, to help provide extra detail about vehicles used to car pool. 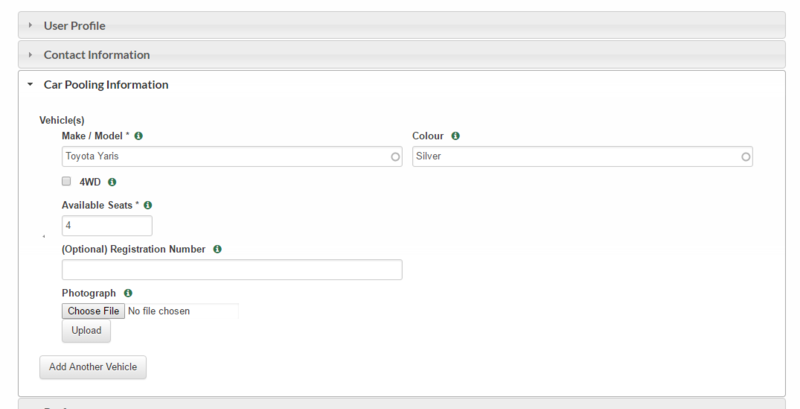 The registration number field has been retained, but is optional. First, you need to add a vehicle to your profile. When you visit your account edit page, you'll see a new section - Car Pooling Information. This is where you can add vehicles. Once you save your vehicle, whenever you nominate for an activity you will see a dropdown selection box appear, prompting you to select the vehicle you wish to take. You can either select your vehicle, or choose "No Vehicle" to opt to offer no vehicle for car pool. 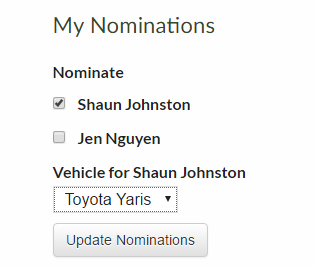 When you nominate, the vehicle will appear in the row containing your nomination, in the Car Pooling column. After you nominate, you can change or remove the vehicle by clicking the "Change Vehicle" link below the vehicle details. A popup containing a form will appear, allowing you to change or remove the vehicle. We haven't forgotten leaders! The printable PDFs for activity nomination lists also contain car pooling information. If you have any questions about the Car Pool Information feature, feel free to get in contact via our contact page! Hope you enjoy using the new feature. Happy walking!